Common glass apothecary containers for crude drugs, ointments and liquids were among the many functional products made by skilled glassblowers, who might also create windows, drinking vessels, beads, and laboratory apparatus. 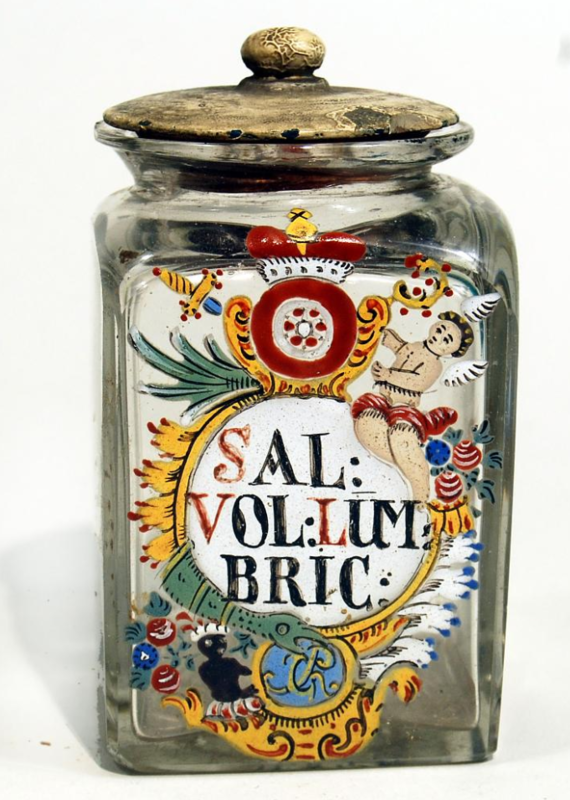 Glass drug jars were not considered to have great monetary value and were fragile; consequently, such jars for holding oils, tinctures, and syrups once prevalent in German apothecaries of the 18th and 19th centuries are now very rare. The Bristol-Myers Squibb European apothecary has more than three-hundred glass containers. Glass drug jars can be divided into three distinct groups. The first is composed of round or square-shaped jars with clear glass; these free-blown or mold-blown vessels are decorated with Baroque and Rococo motifs including shields, birds, festoons, ribbons, and crowns. The second includes jars such as the set of urn-shaped white or milk glass (milchglas in German) vessels meant to imitate more expensive porcelain ceramics. The third, of particular importance includes six 17th century wide- mouth blown vessels made from heavy green glass and probably used to store bulk products. The ornamentation applied to the glass containers is of two types; baked enamel and cold-painted application. The more permanent of the two, enamel, uses pigments composed of finely ground glass that are fired to fuse the colored glass to the vessel. The simpler form of decoration is cold painting. Motifs are applied to the glass with paint and are not fired in a kiln. Once the paint dries, a thin layer of varnish is applied to prevent the paint from flaking and being scratched. Identifying individual vessels to a particular glass house or a geographical region is very difficult. Many pieces were made by itinerant craftsmen who worked at any number of glasshouses scattered throughout the German forests. The vast concentration of glass houses were in eastern Germany stretching into present-day Czech Republic and western Poland. It is easier to determine for whom containers were made through analyzing the decorative motifs on the glass, which might include ducal crowns or a coat-of-arms. Even the animals depicted can help in determining which apothecary the jars were used. For instance, the lavishly decorated drug jars 1991.0664.0222-0224 depict a small, black figure with a white turban in the lower left corner, the symbol for the Morhan Apotheke or Moor Apothecary in Mainz, Germany. 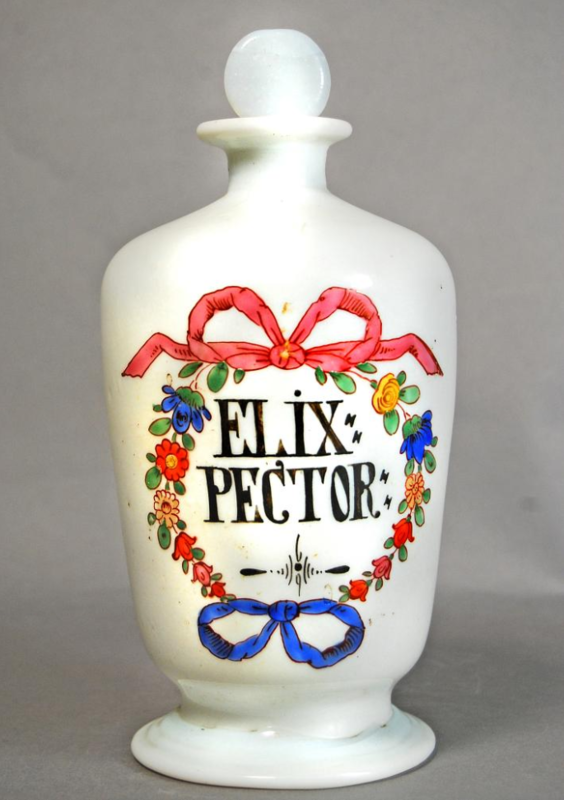 This blown glass drug container is marked, ELIX: VISCER: H:" The opaque white color of the glass comes from the addition of tin oxide and was meant to imitate porcelain. This blown glass drug is marked, UNGV: ANIPSOR. The opaque white color of the glass comes from the addition of tin oxide and was meant to imitate porcelain. This blown glass drug jar is decorated with a floral wreath and ribbons. The jar is marked with an alchemical symbol and, COCHLEAR. The opaque white color of the glass comes from the addition of tin oxide meant to imitate porcelain. George Urdang, author of , noted that this jar, depicting two "eagles" flying toward the sun was made for the orphanage pharmacy (Waisenhaus Apotheke) in Halle, Germany. 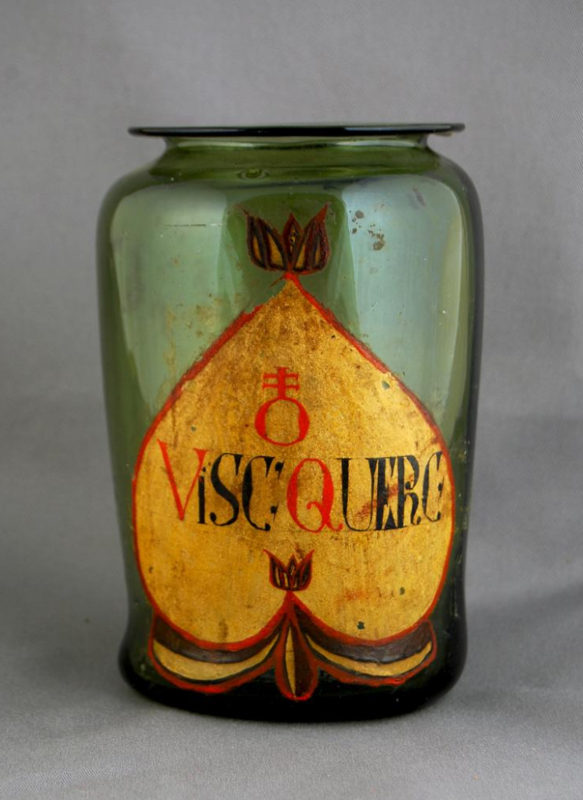 He also believed the manufacturer of this particular jar and 1991.0664.0231 can be attributed to the Globsow glass works, dating from about 1775. The jar is illustrated on page 22 of the Squibb Ancient Pharmacy Catalogue. This baked enamel label is marked in red and black AQ SAPHIREA. The European Apothecary Collection contains dozens of drug jars with this same embellishment. The generic blue and yellow decoration with its stylized crown above the cartouche is similar to glass drug jars in the collection of the Deutsche Apotheken Museum in Heidelberg, Germany. This blown and molded bottle reads AQ CARDUI BENED in black text, with the first initial of each word in red. It would have contained Aqua Cardui Benedicti, or Blessed Thistle Water that would have been made from the Cnicus benedictus thistle. It was used as a tonic, diaphoretic, and emetic. This square-shaped bottle has a baked enamel label. It is marked with the alchemical symbol for powder and TRAGEA STOMACH.